KD and Westbrook favorites to win MVP. NBA MVP odds have been revealed and Vegas sports books believe last season's Finals MVP, Kevin Durant, and last season's regular season MVP, Russell Westbrook, have the best chances of being crowned MVP next season. According to SportsInsights, the former teammates both came in at +350, followed by San Antonio's Kawhi Leonard at +550 and James Harden at +700. LeBron James and Giannis Antetokounmpo are next on the list, both tied at +750. After those players there is a sizeable gap in the odds to win 2017-18 NBA MVP. Two-time league MVP Stephen Curry is next on the list but his odds are listed at +1100. Next up is Anthony Davis at +1600, followed by Paul George and Isaiah Thomas who are both sitting at +2000 to round out the Top-10. Last season Russell Westbrook opened up with odds of +300, which were second best only to Steph Curry's +250, and we all know he went on to average a triple-double en route to his first MVP award. Of course, next season Westbrook will once again be playing alongside an MVP-caliber talent in Paul George so he won't be expected to do it all for the Thunder. 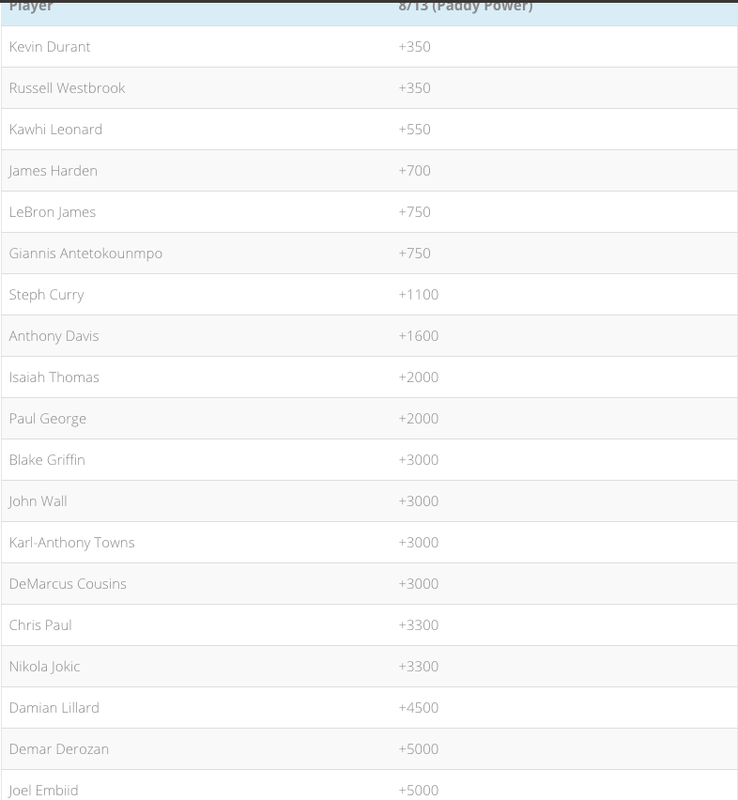 Check out the list of NBA MVP odds below, courtesy of SportsInsights, and let us know who you're putting your money on.